Erwan Bergot was born January 27th, 1930 in Bordeaux and is a French writer and journalist. 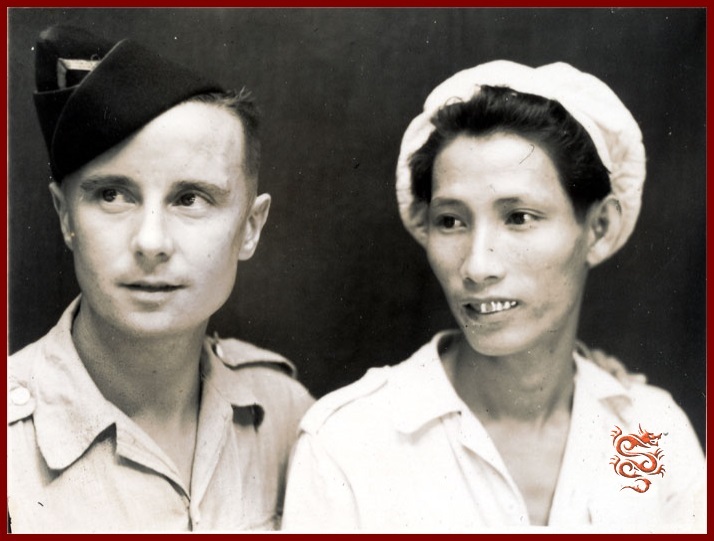 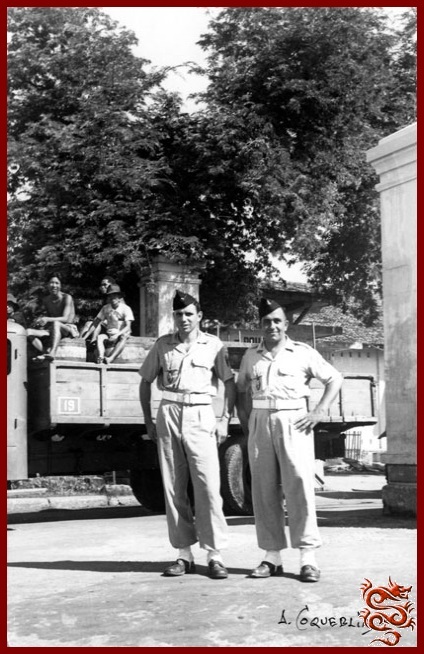 As a former paratroooper he went to Indochina where he served in the 6th batallion of Bigard’s Colonial Paratroopers and then on to head the the heavy mortar company of the First Foreign Paratrooper Regiment at Ðiên Biên Phu. 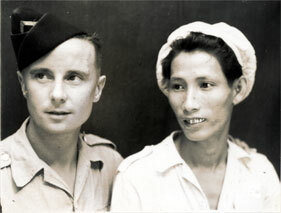 He was taken prisoner and experienced the hell of the internment campst. 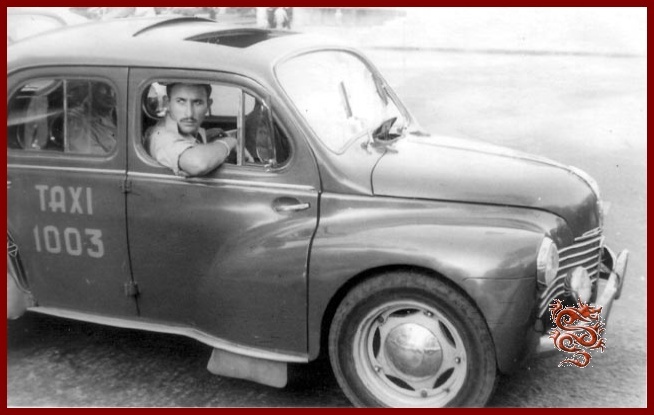 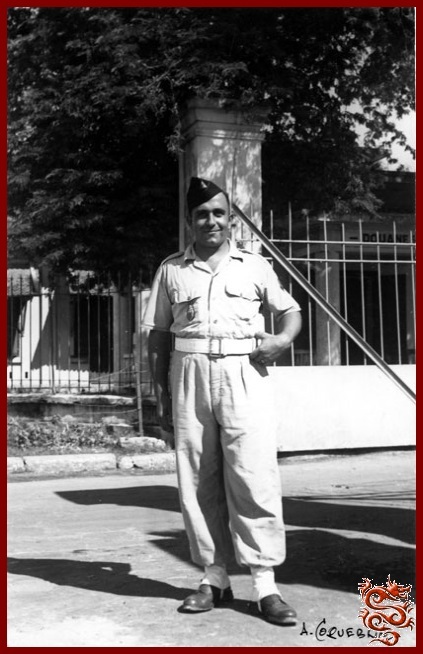 In 1955 he is recalled to serve in Algeria with the 2 nd Foreign Paratroop Regiment, and the 11th Shock (special forces), and was severely wounded in the right eye during a clash in the Constantine and finally left combat and turned to writing and journalism. 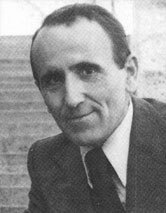 Erwan Bergot died May 1st, 1993, in the Val-de-Grâce hospital in Paris. 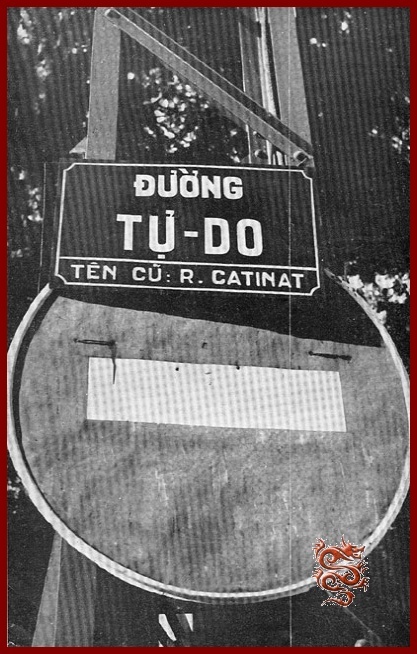 A French politician is received at the Tân Sơn Nhứt airport (located at 6 Km. 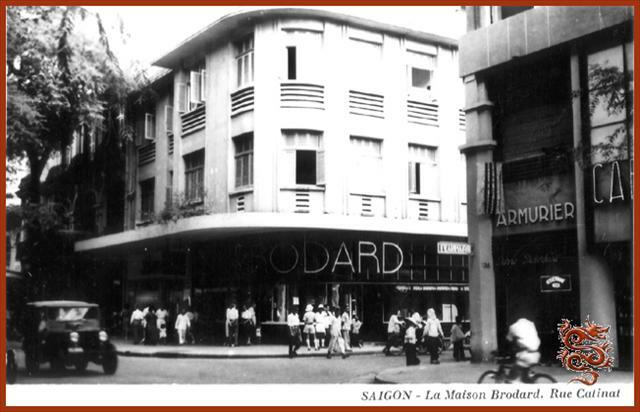 from the center of Saigon) by officers of the Gendarmerie and of the Republican Guard. 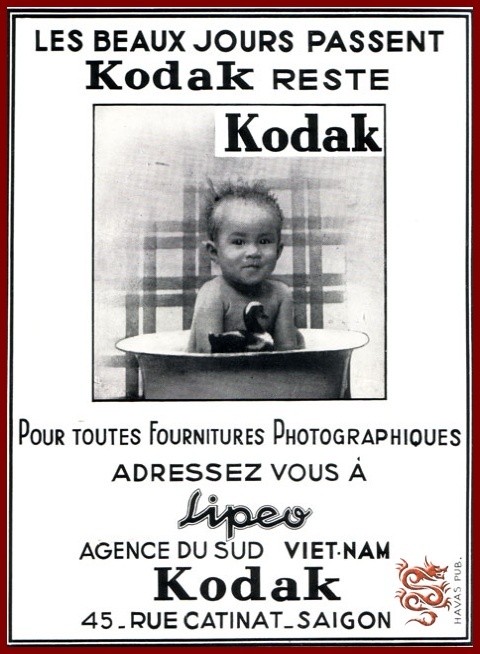 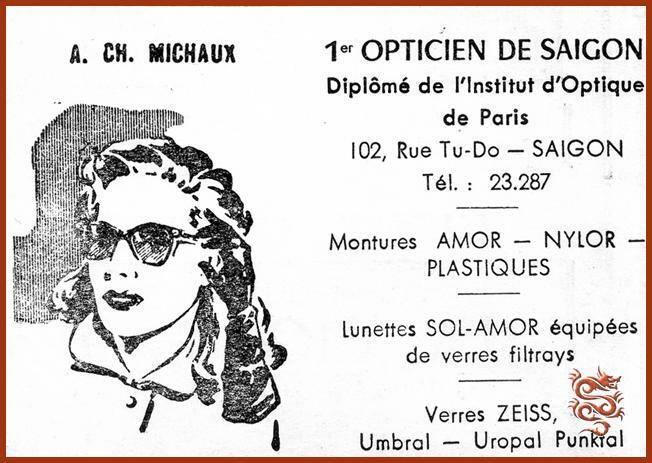 © Photos by Raymond Varoqui, born on July 7th, 1921 in Ottange (Moselle), died February 8th, 2013. 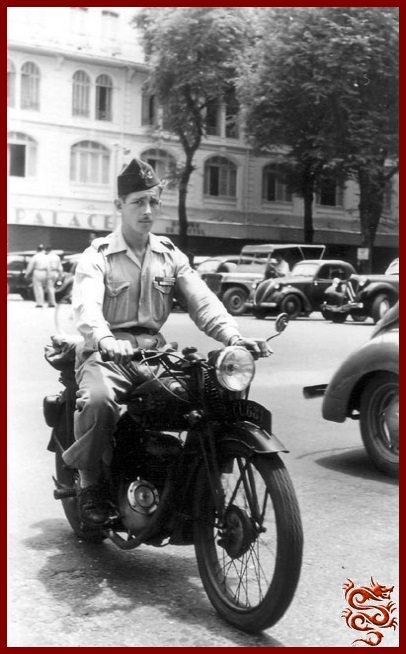 He was assigned to the SCA (Army Cinematographic Service) as a photojournalist in 1948. 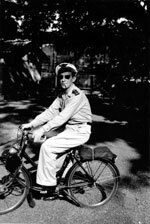 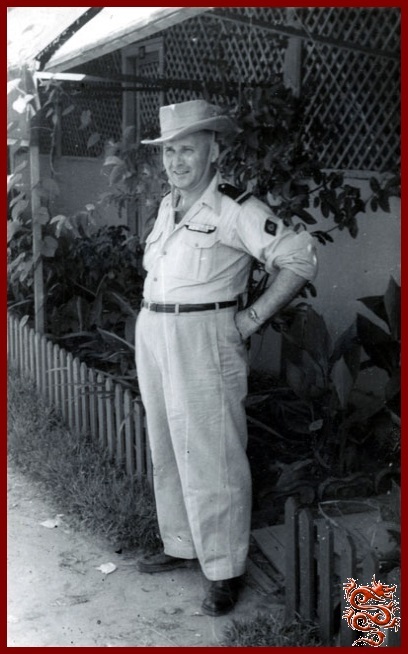 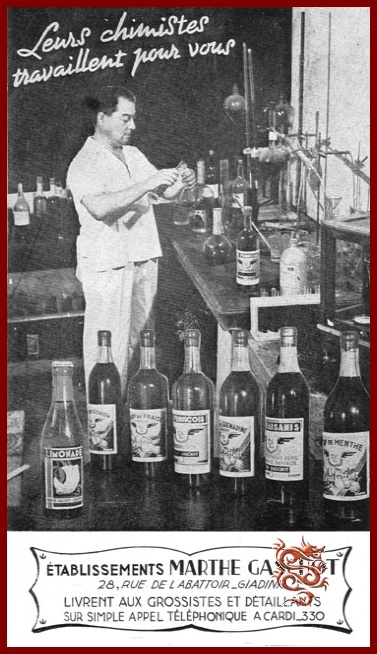 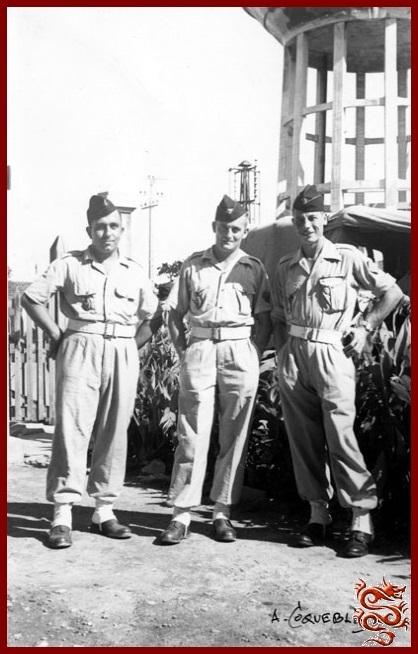 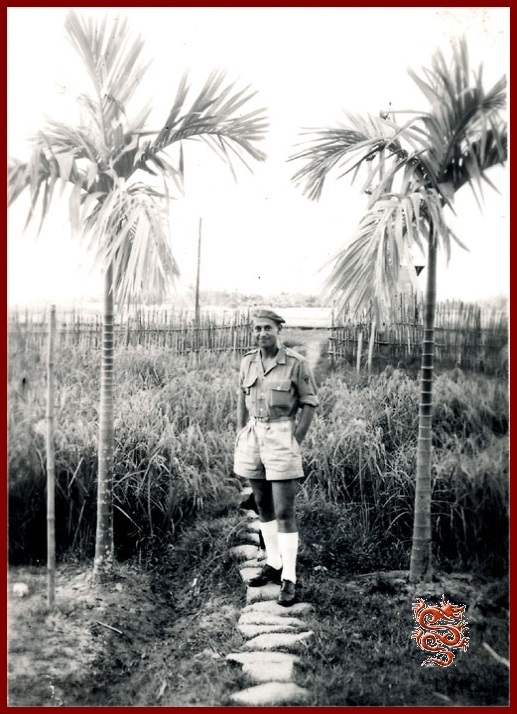 He was immediately sent on a mission with the SPI (Press Information Service) in Indochina. 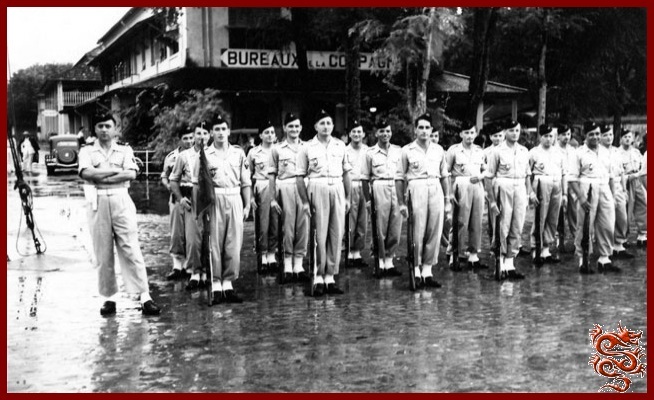 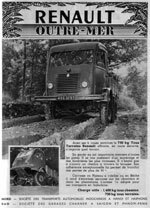 December 1949, the Gendarmerie received the order to form three marching legions of Republican Guards to send to Indochina. 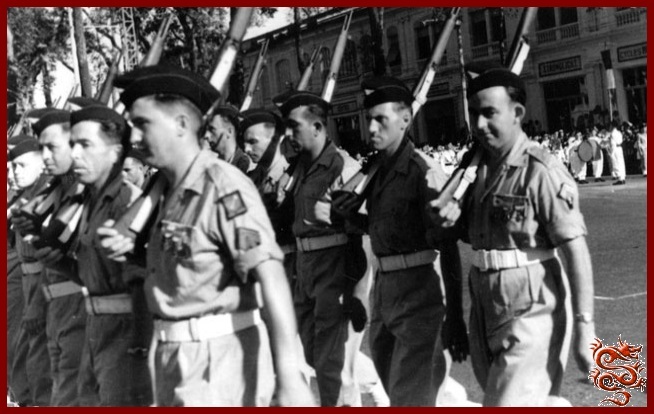 The first legion was formed on December 25th, 1949, at Horb am Neckar (Germany), the second at Romans in the Drôme, and the third at Pamers in the Ariège. 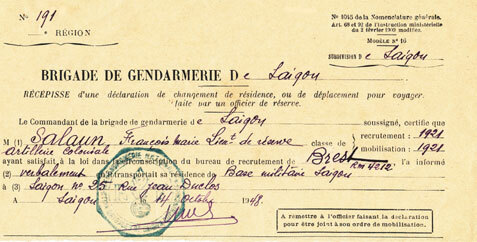 Total personnel: 1000 officers, enlisted men, and gendarmes each. 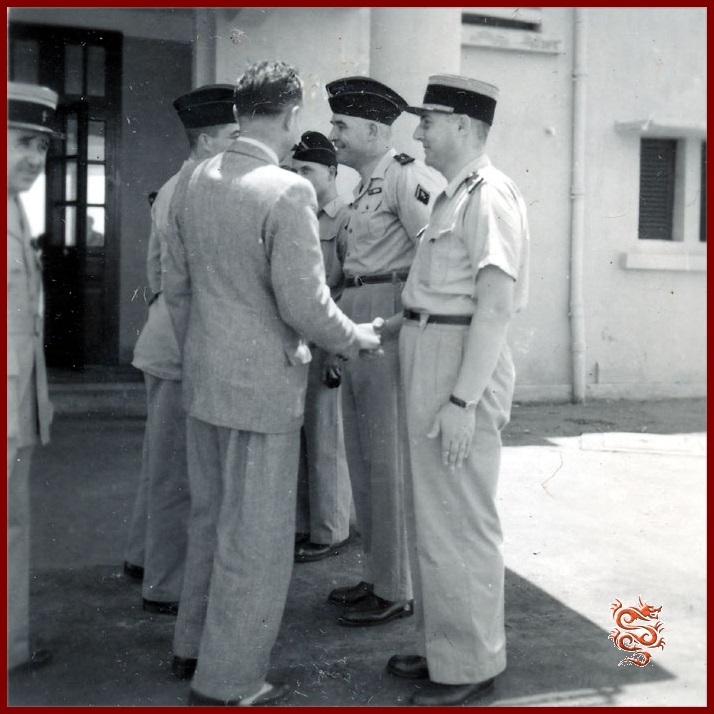 Source: Erwan Bergot in his book, "Gendarmes in Combat". 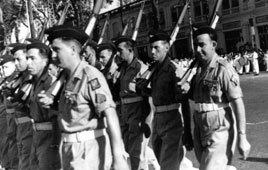 In the photo taken by Adjutant Chief Raoul Benezet: Turning over the colors of the Republican Guard to the First Marching Legion of the R.G. 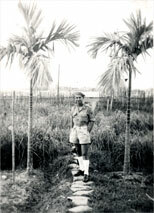 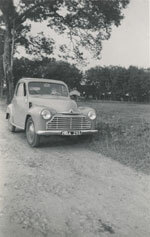 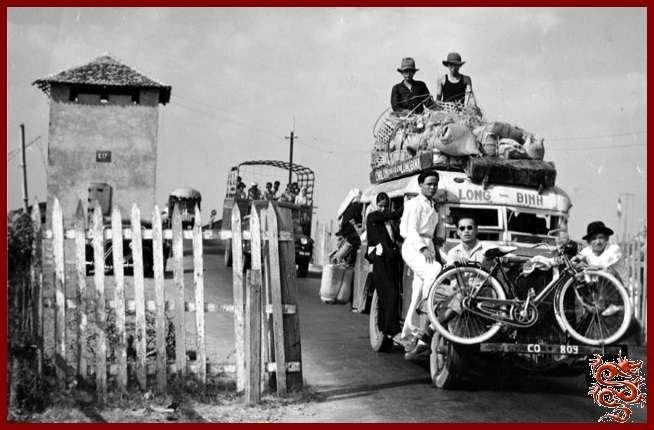 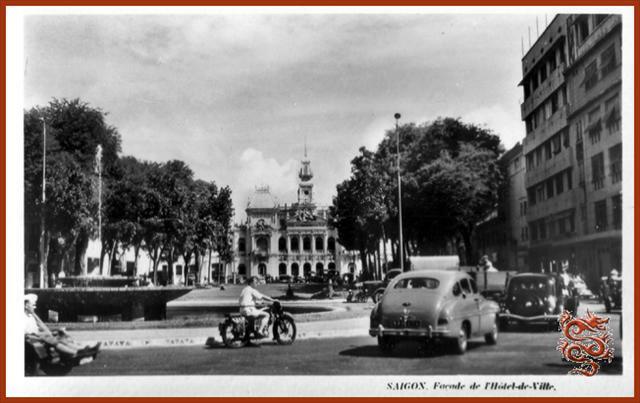 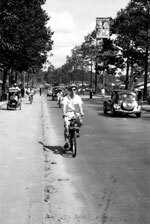 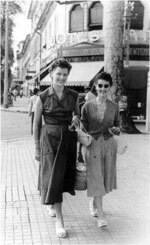 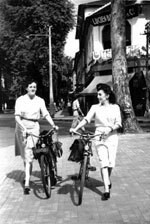 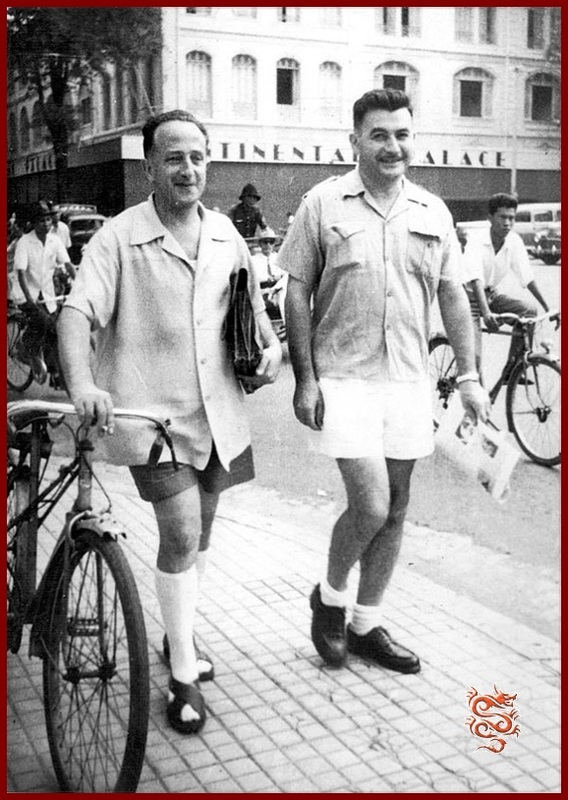 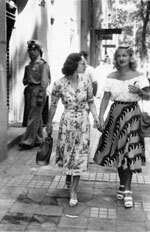 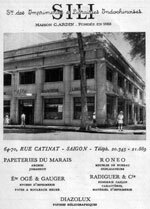 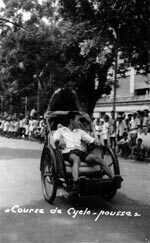 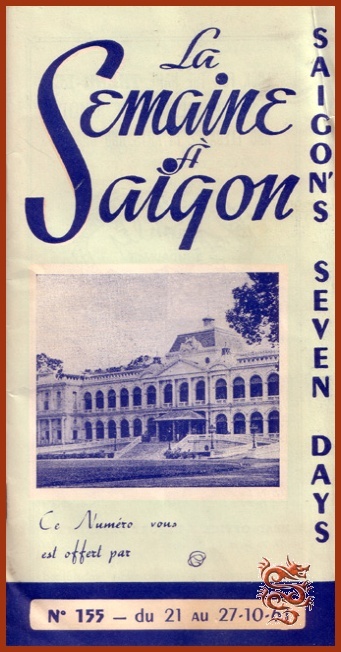 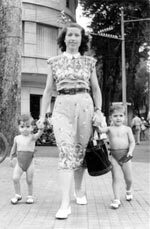 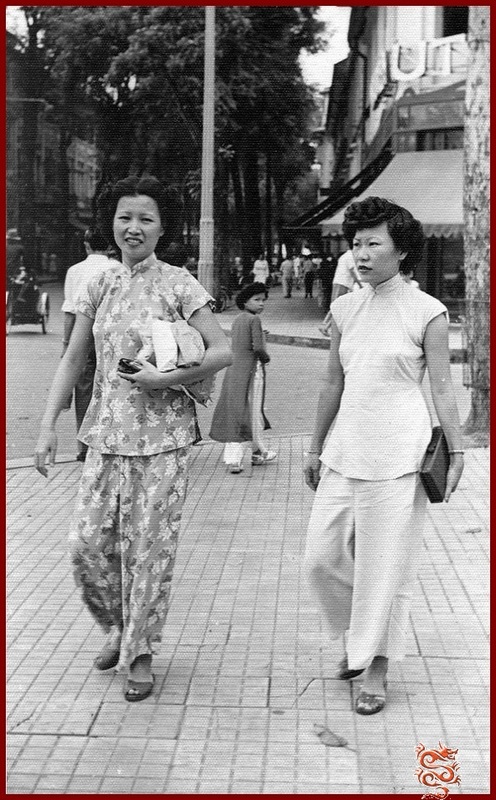 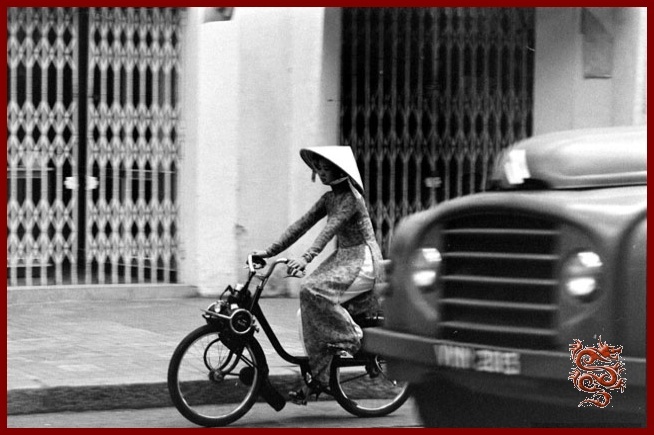 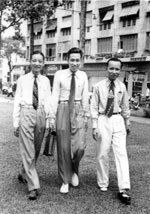 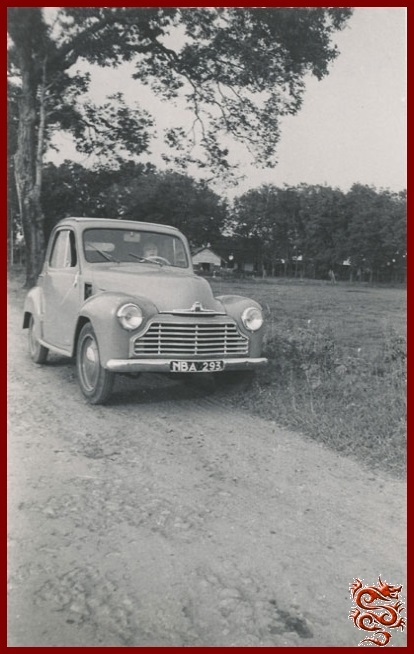 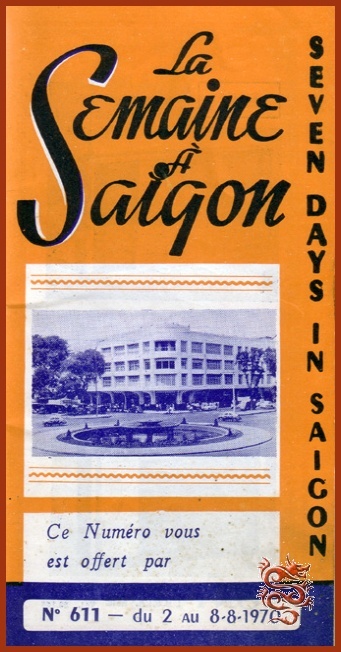 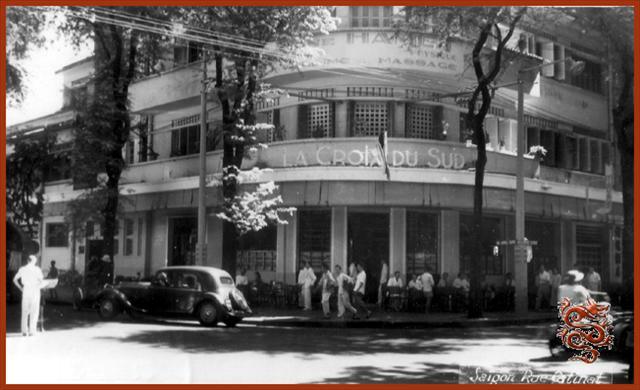 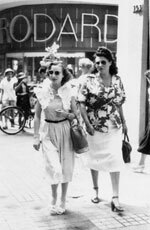 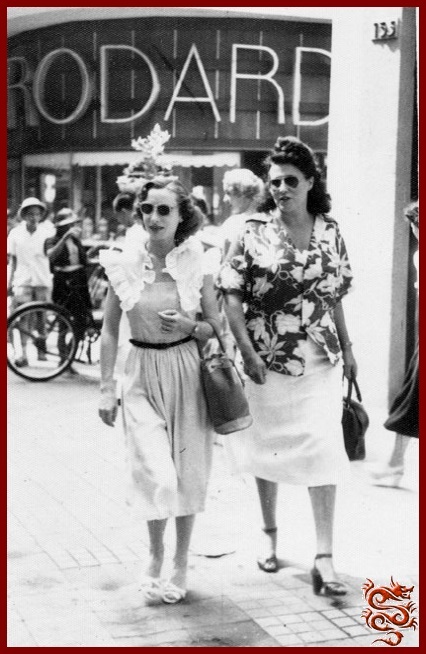 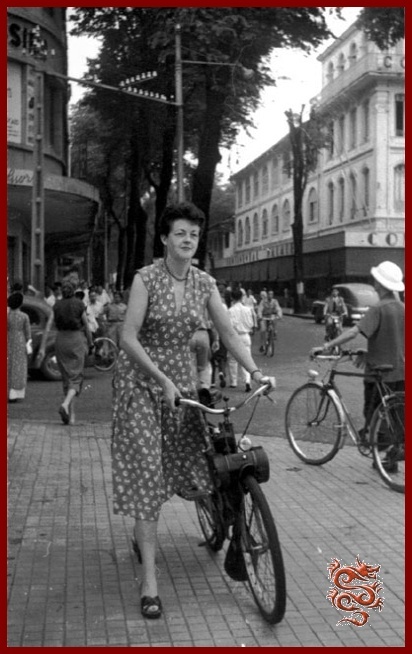 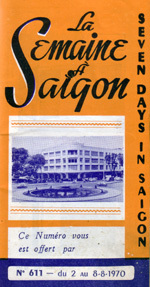 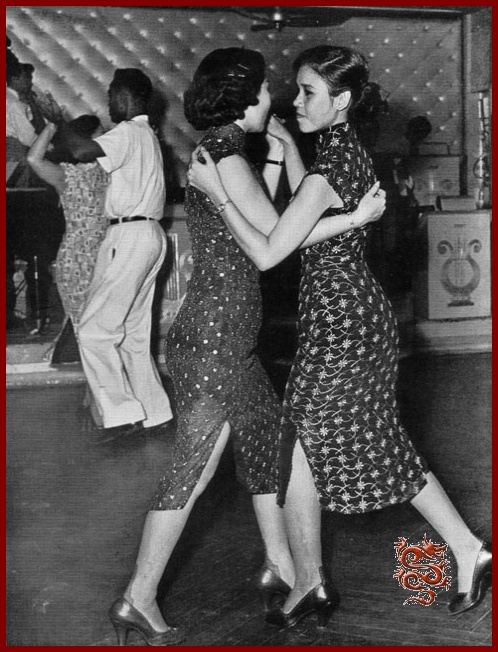 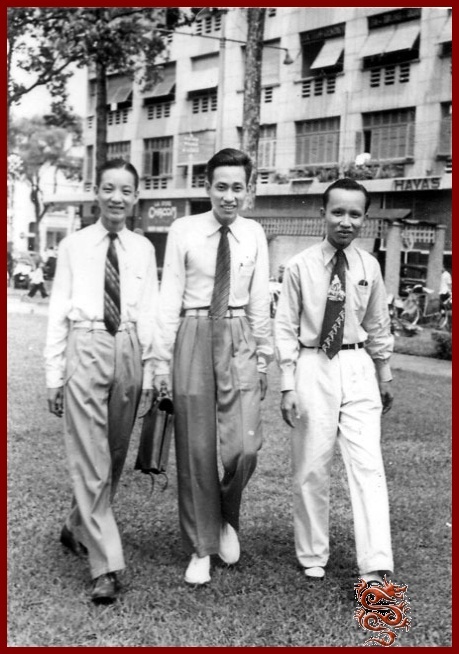 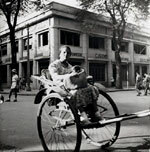 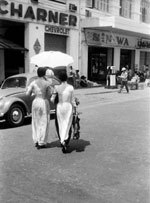 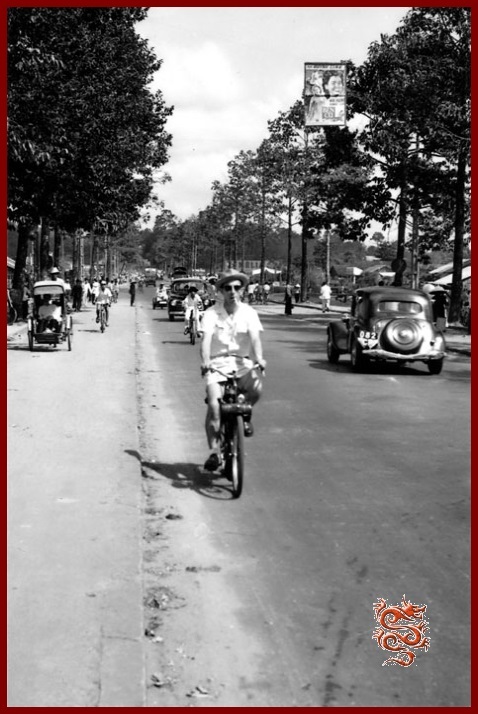 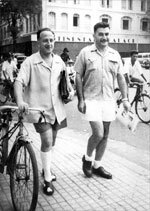 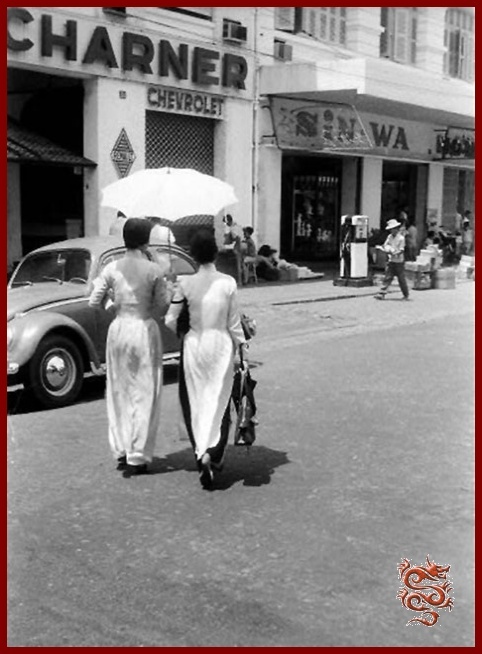 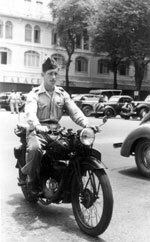 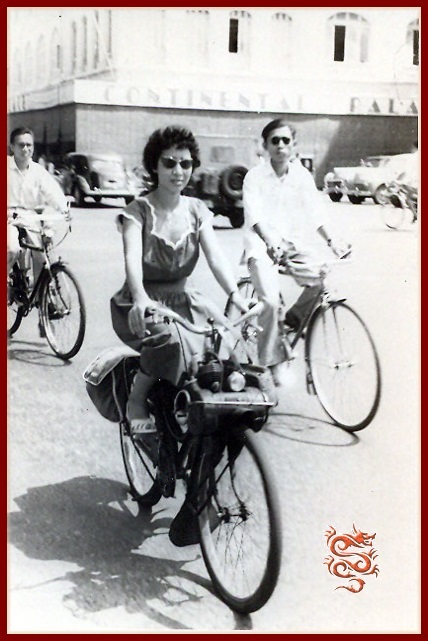 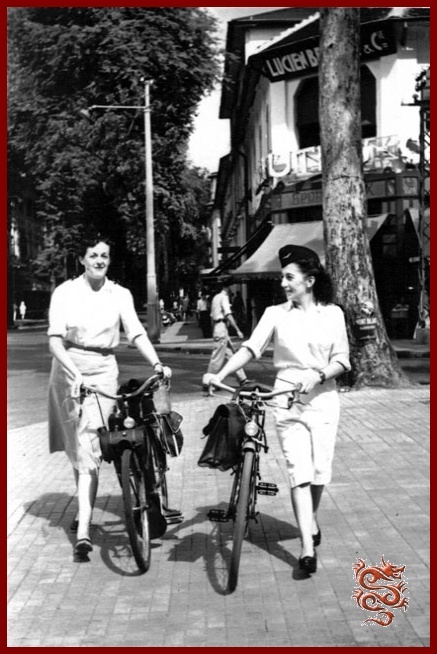 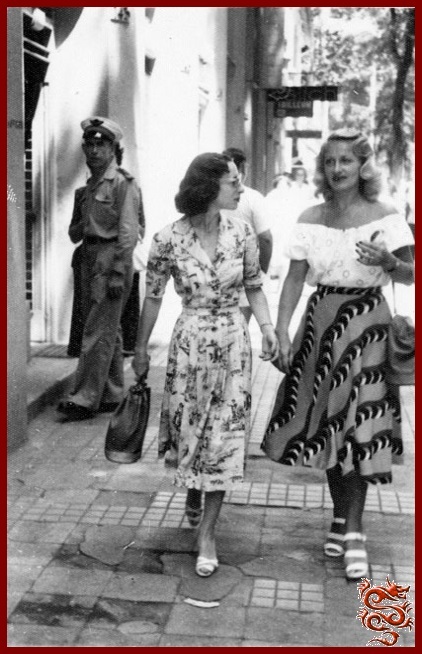 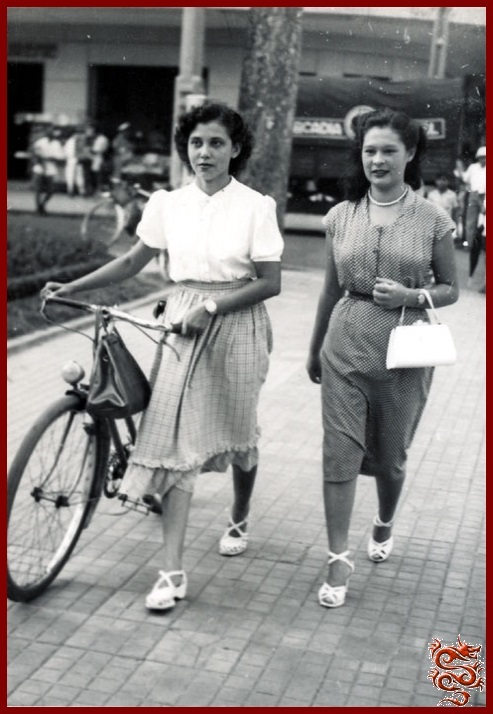 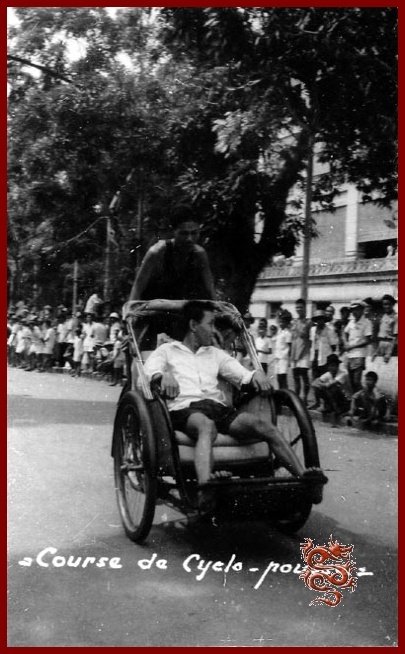 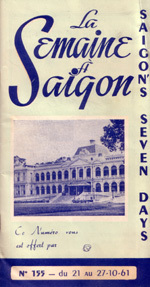 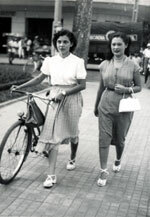 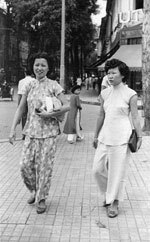 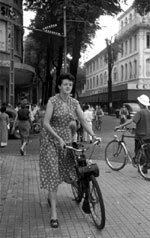 in Saigon, February, 1950. 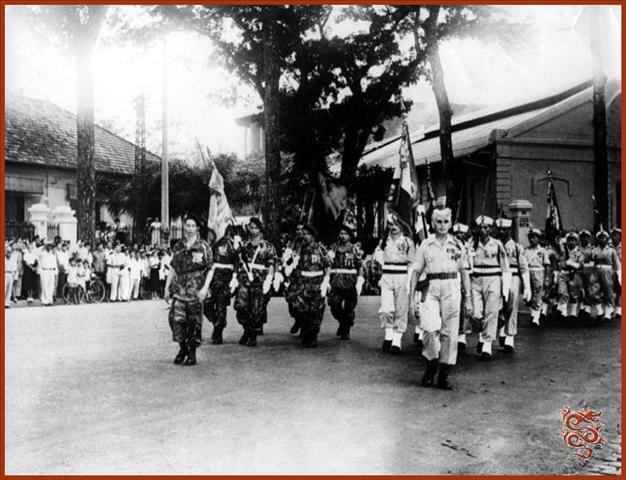 Left: The different Police Forces in Indochina. 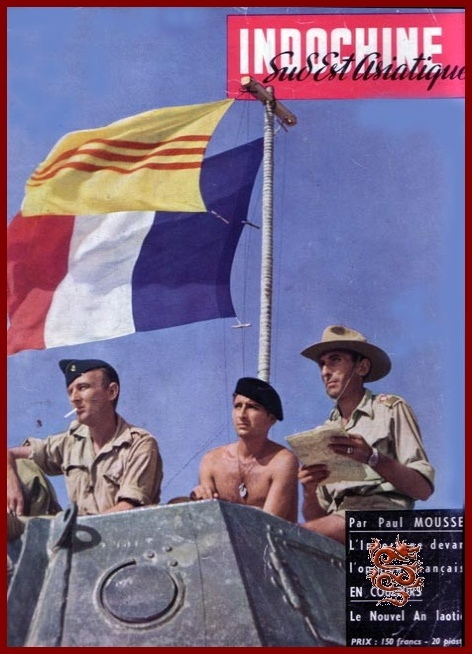 Right: The Guard Flag, decorated with the “Croix de Guerre”, of the T.O.E. 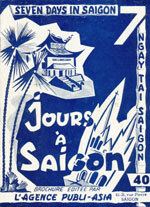 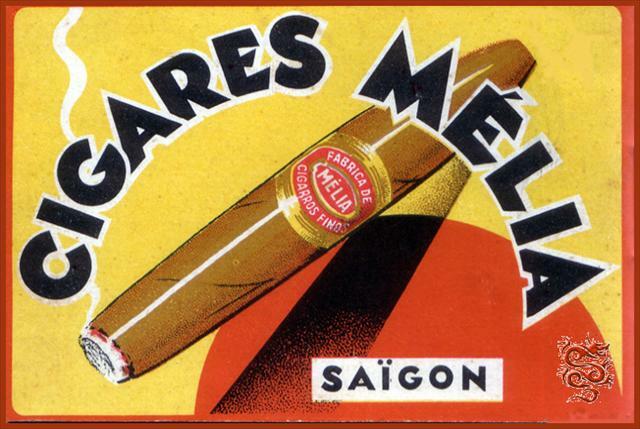 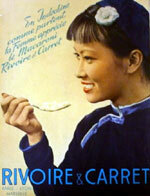 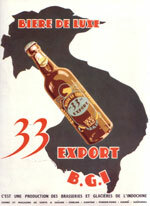 (Foreign Theater Operations), on February 15, 1954. 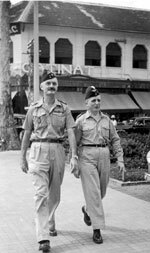 Below: On July 4 th , 1954, a French Police Officer and a Vietminh Officer stand guard for the Trung Gia (Tonkin) conference, 40 Km. 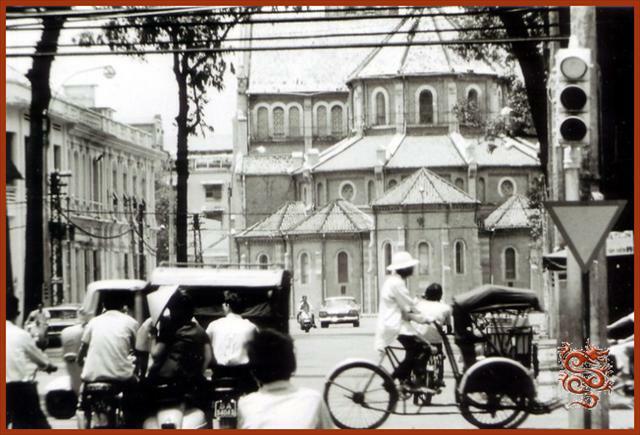 north of Hanoi. 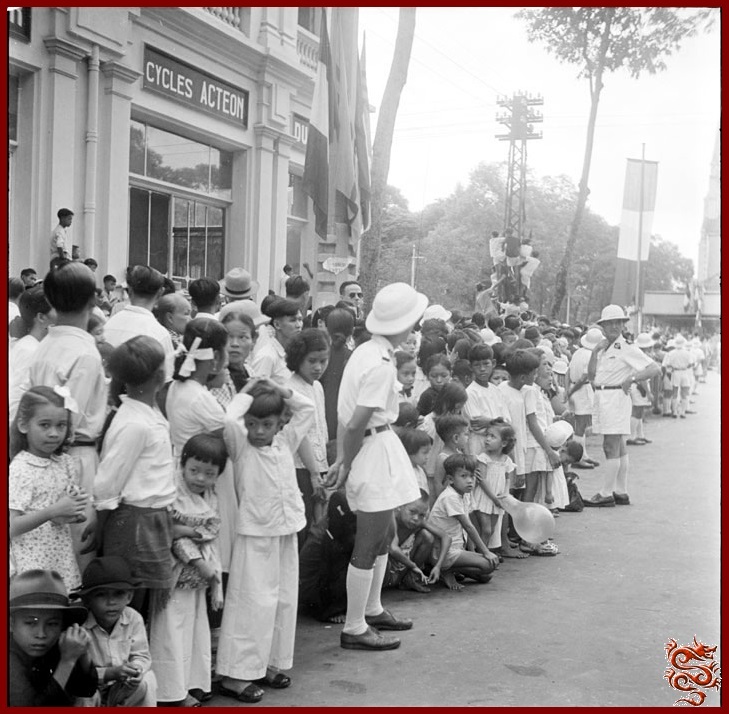 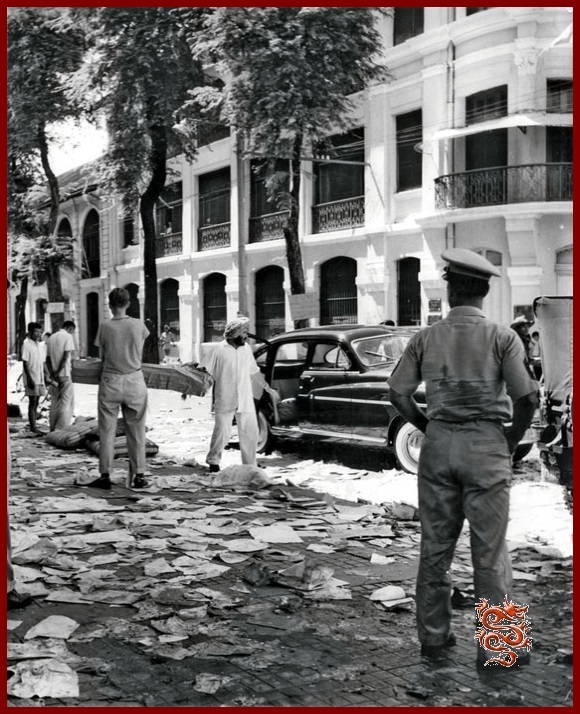 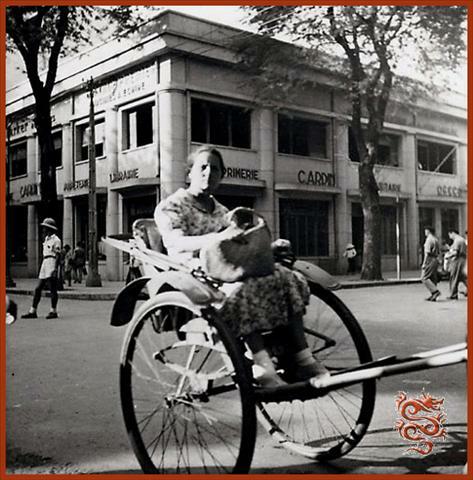 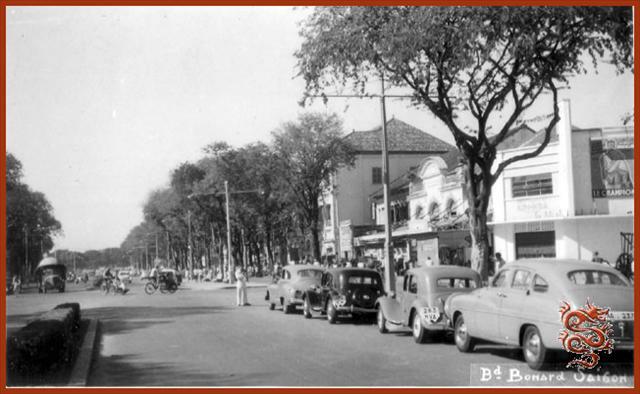 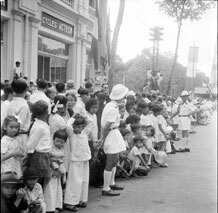 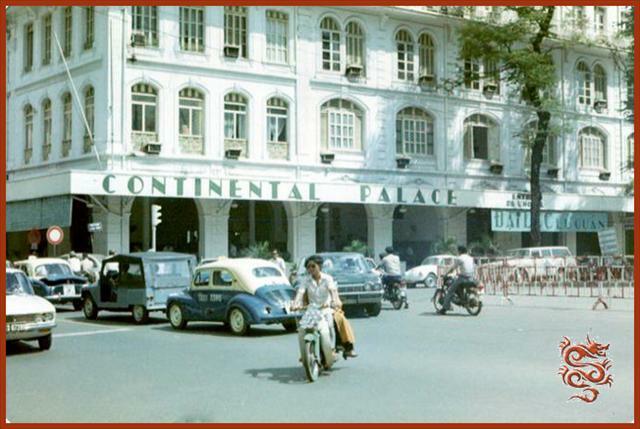 In front of the Jean Comte garage on Norodom Boulevard, the crowd gathers to watch the July 14th parade in 1950. 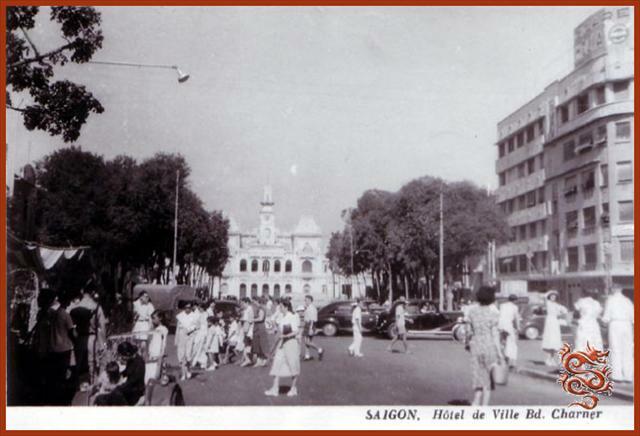 The streets of Saigon are decorated with French and Vietnamese colors for the occasion. 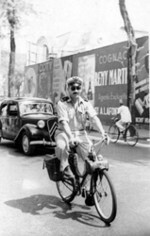 the photo on the right shows a detachment of the Colonial Police (Gendarmes). Gendarmes Daguzan, Pagès, and Lalanne in front of the police station. 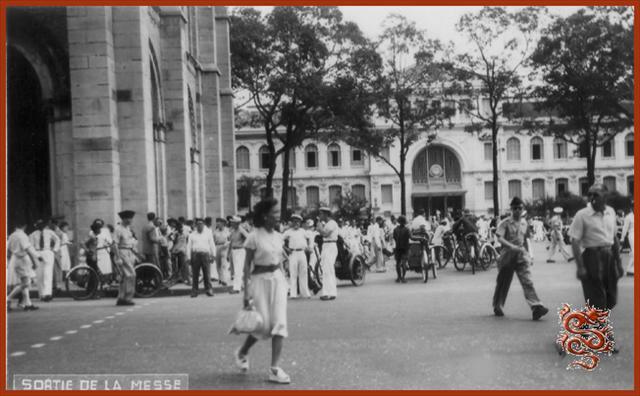 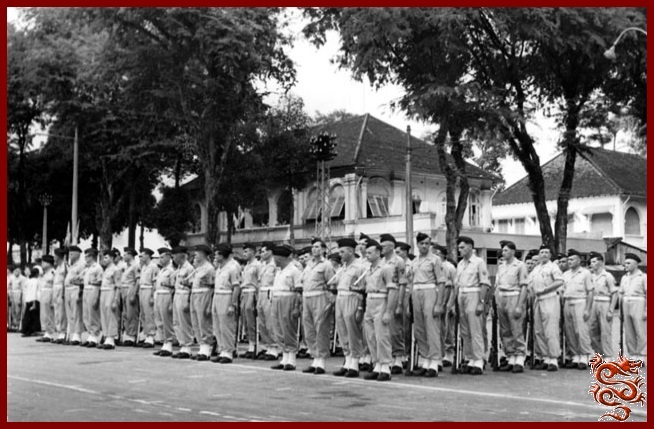 The Gendarmes during the commemorative ceremonies on November 11th, 1952, Norodom Boulevard (now Lê Duẩn) in front of the Jean Comte Company in Saigon. 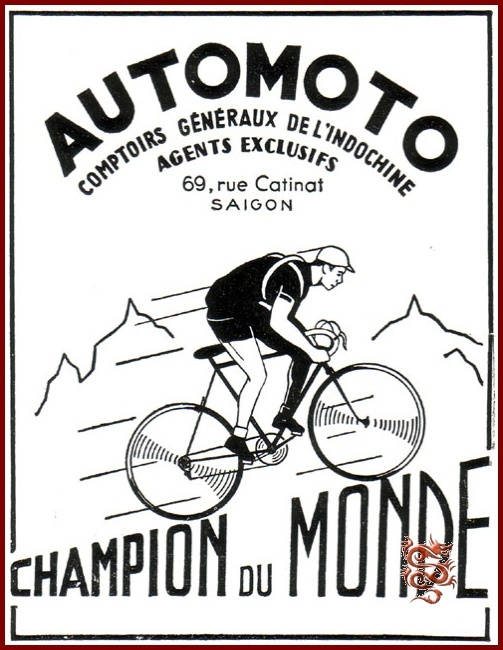 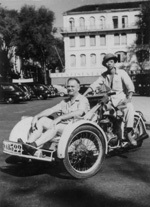 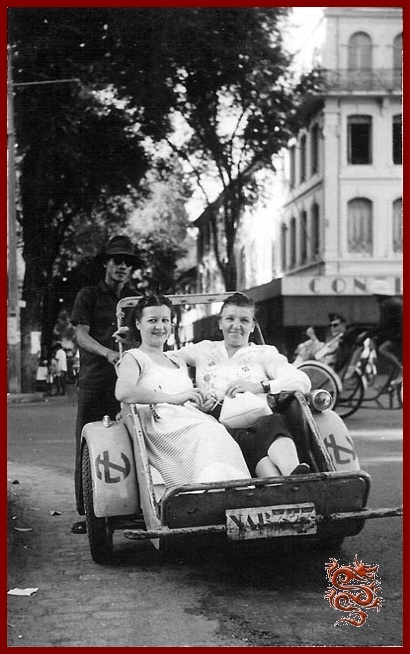 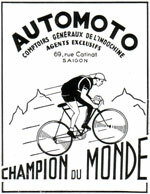 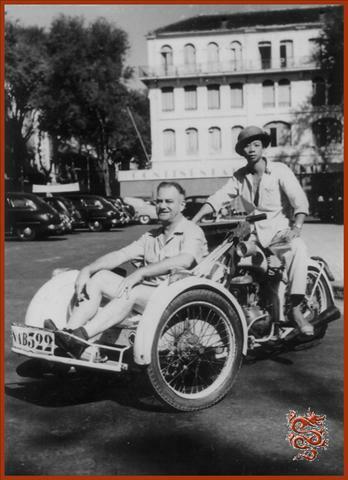 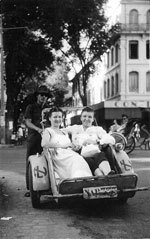 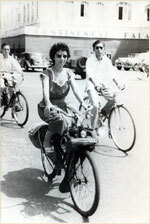 Left: Gendarmes on a cyclomoteur on Catinat Street near the Continental Hotel. 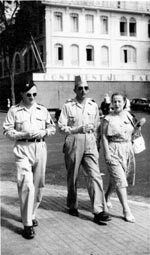 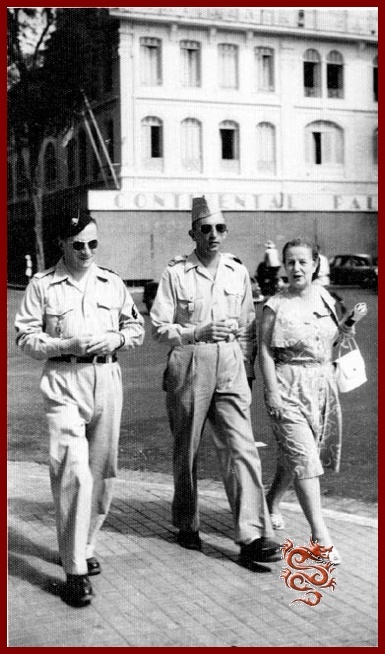 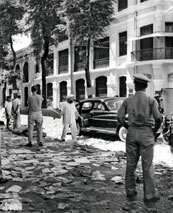 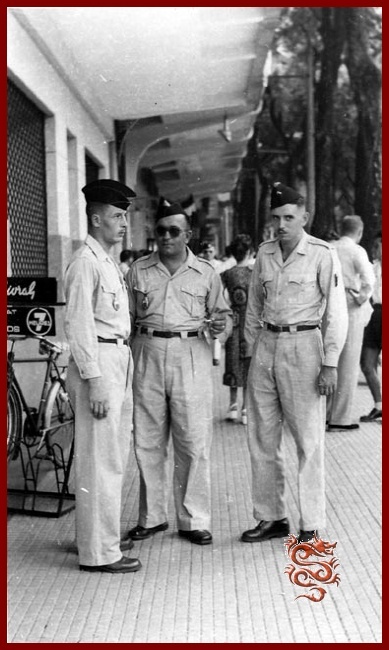 Center: On Catinat Street, Gendarmes in front of the Café Givral. 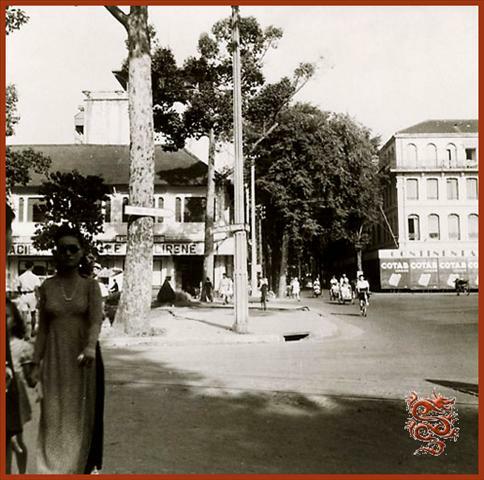 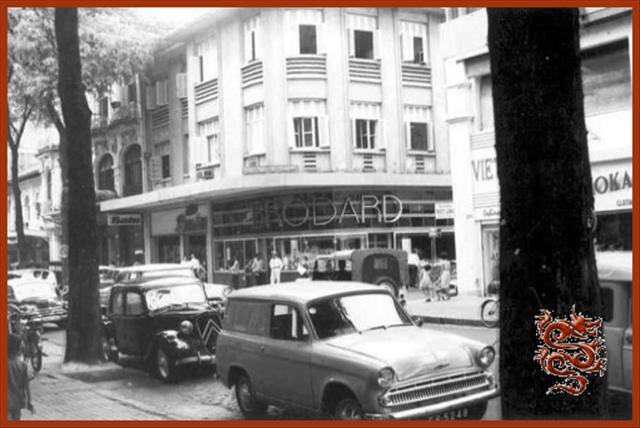 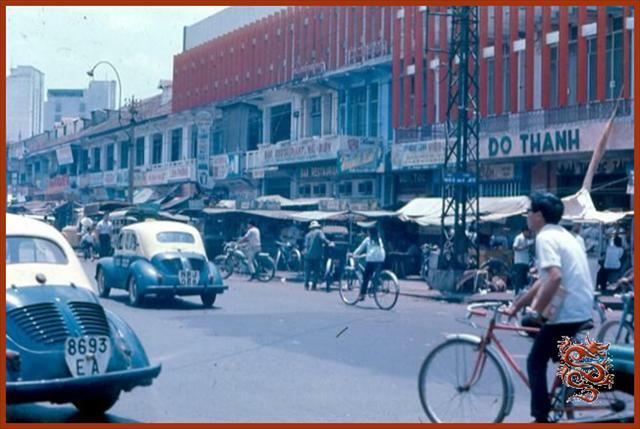 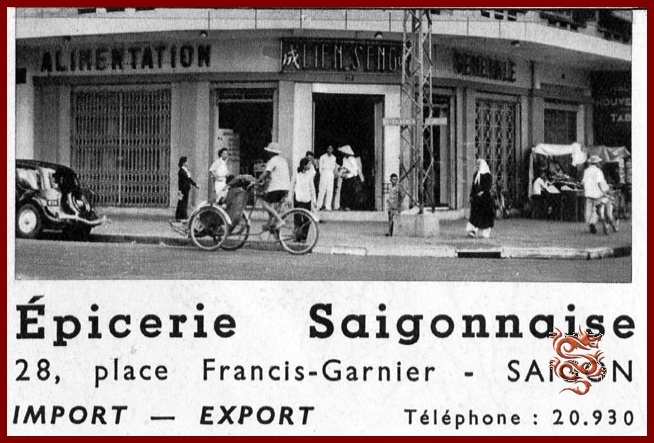 Right: Gendarme in Saigon September 4th, 1954. 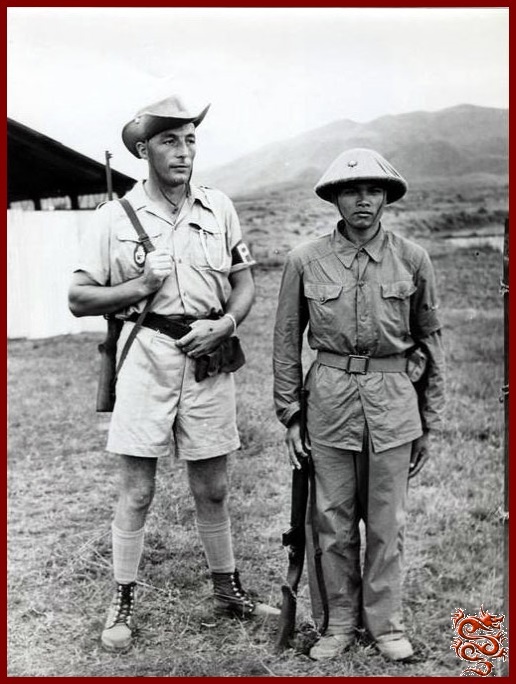 Left : The Gendarme Raoul Benezet and a soldier from the "Cochinchina Republican Guard" (G.R.C.). 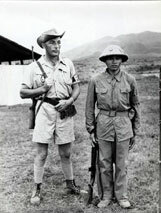 Right : The Gendarme Benezet in Cochinchina. 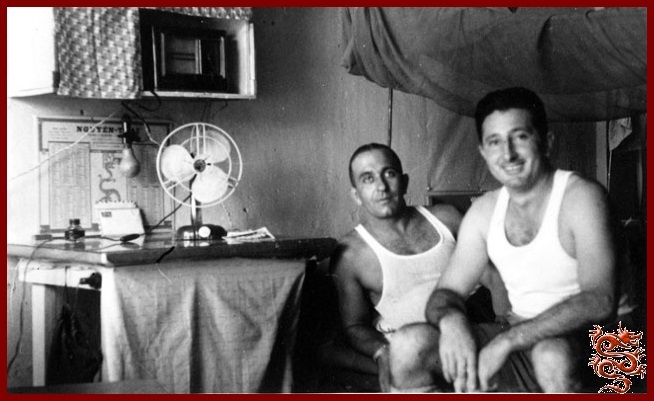 A pair of Gendarme roommates in a Saigon barracks in 1952. 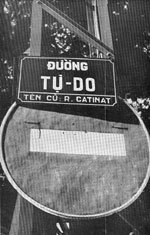 Left: February 8th, 1951, on the Mytho Road southwest of Saigon, a bus loaded to capacity drives past a fortified tower defending access to the road against Vietminh infiltrators. 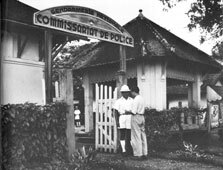 Right: A Vietnamese Gendarme station in Tan An. 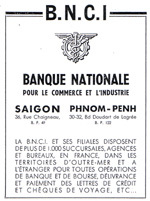 The prolongation of the war results in a heavy increase in personnel. 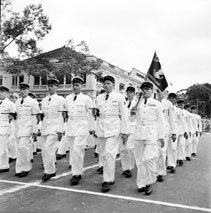 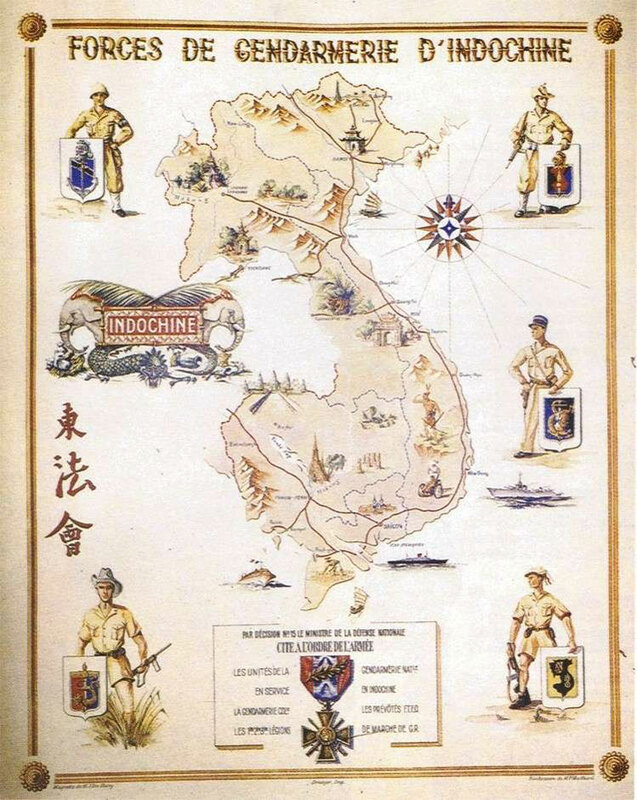 In all, nearly 14,000 men succeed one another on the peninsula between 1946 and 1956, for an average tour of 24 months. 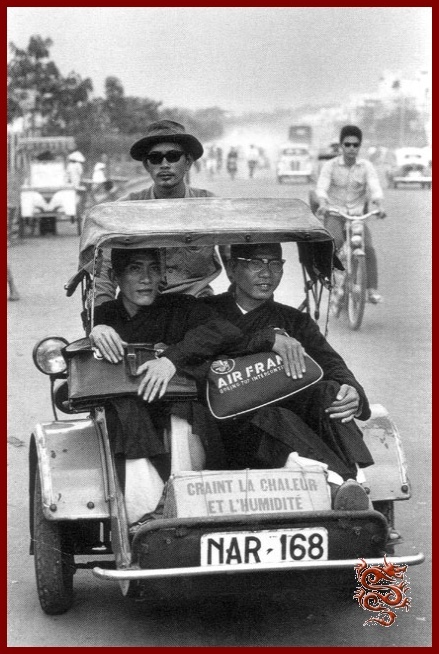 Until 1955, 3,000 Gendarmes are permanently stationed on Vietnamese soil. 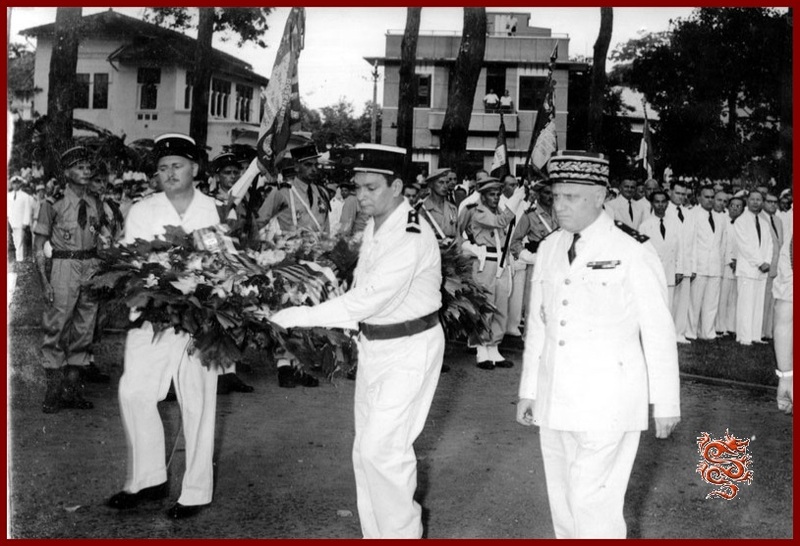 Additionally, during this period the battle order of the Gendarmerie of Indochina evolves under the pressure of events. 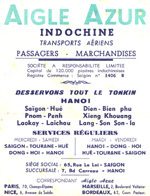 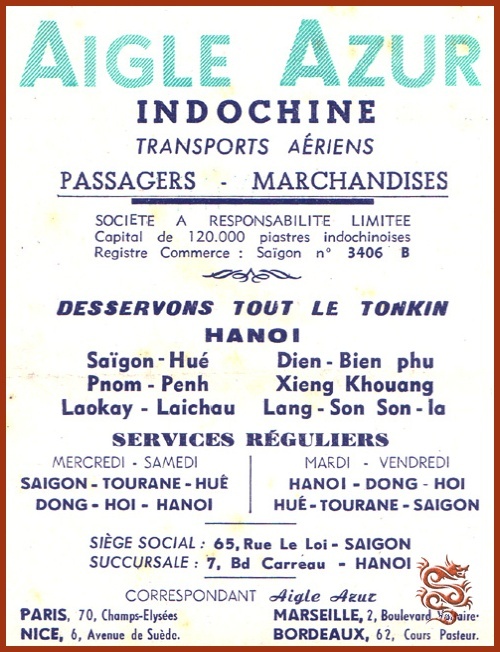 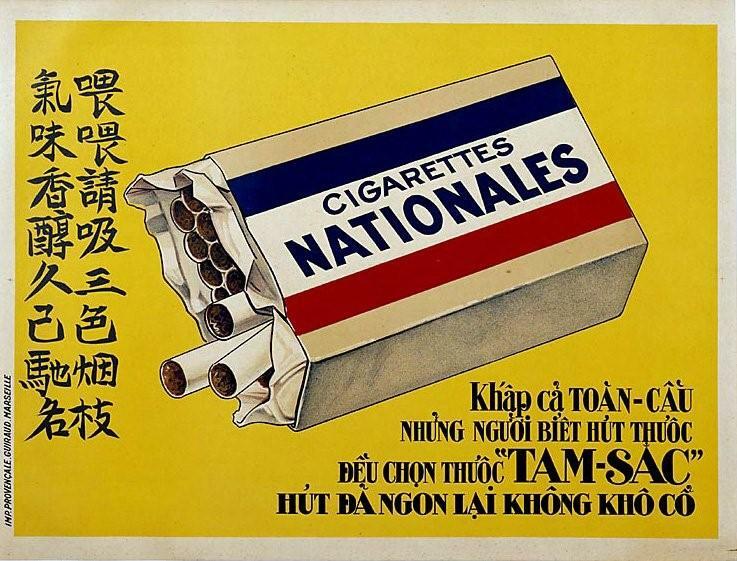 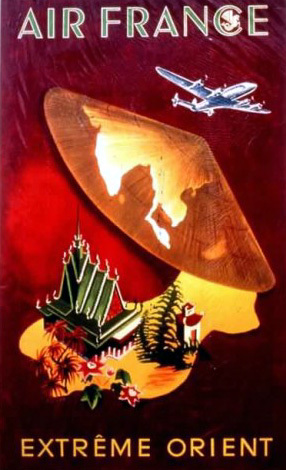 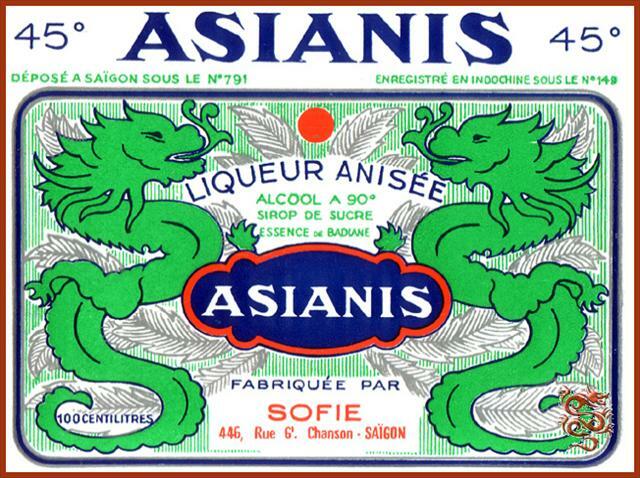 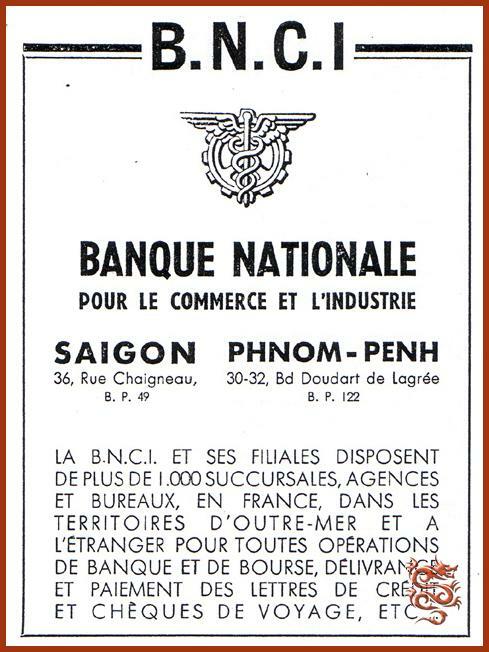 Between 1948 and 1949 the rise to "Independence as part of the French Union" of Vietnam, Laos, and Cambodia results in a transfer of sovereignty to the former Indochinese colonies. 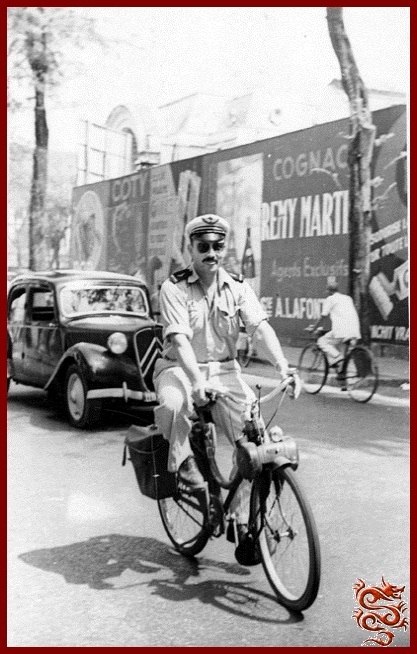 The Gendarmerie detachment must now organize the National Police Forces for the three new states while simultaneously ensuring, temporarily, its usual function. 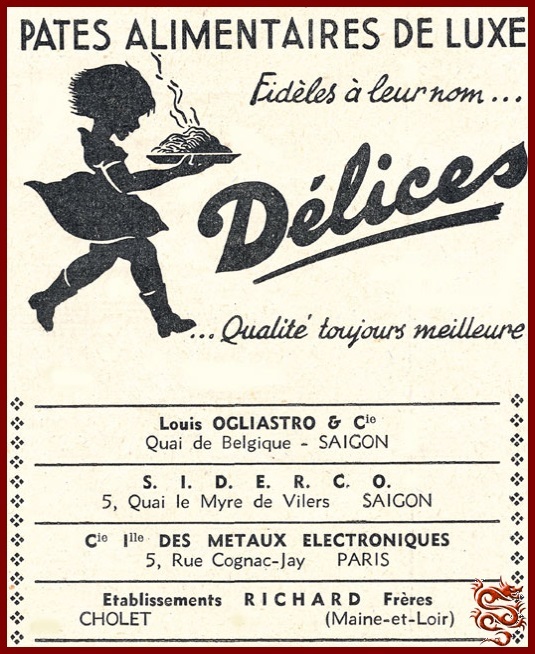 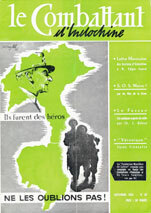 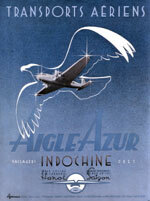 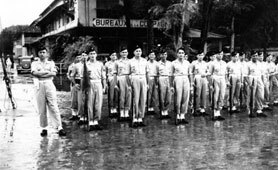 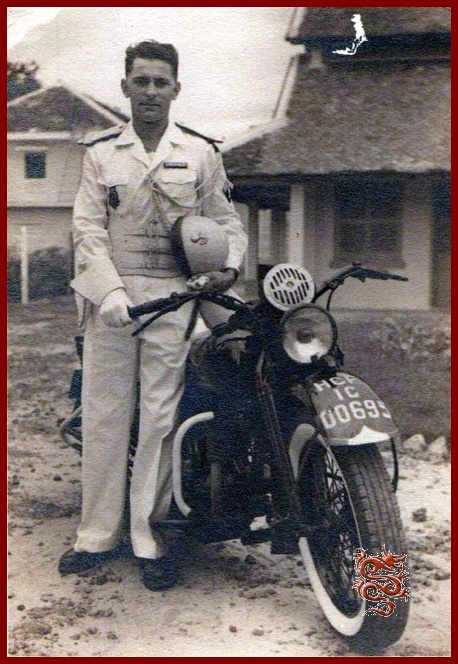 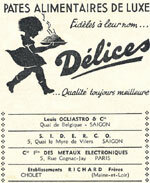 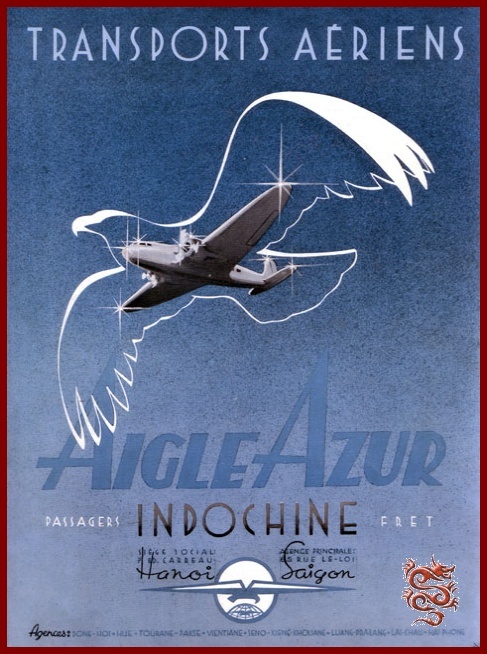 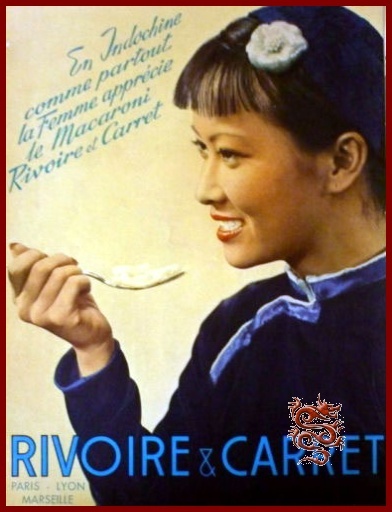 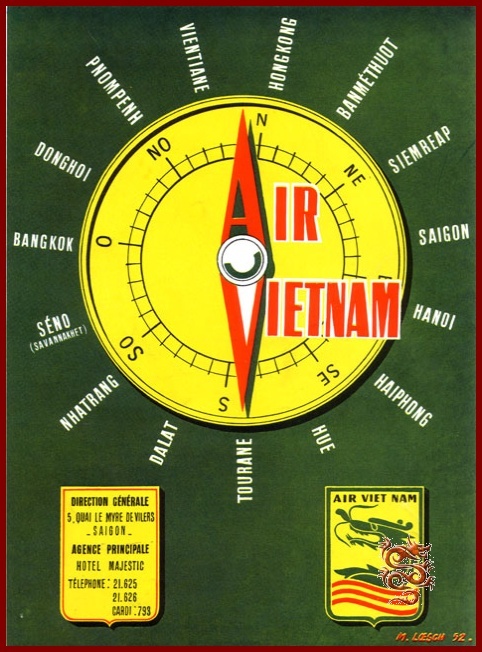 In 1952, the Gendarmerie of Indochina detachment becomes the "Detachment of Gendarmerie of the Far-East". 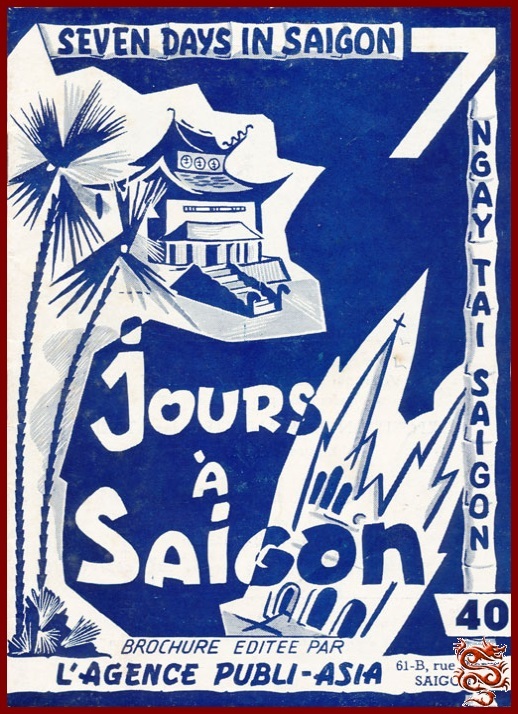 In 1954, the Geneva Accords seal the destiny of France and Indochina by putting an end to the conflict. 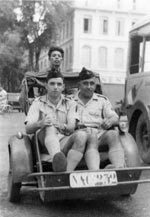 The following year a mixed legion of Gendarmerie assembles all Gendarmes assigned to the territory. 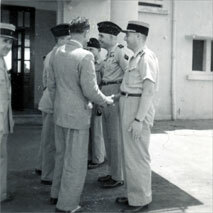 The departure of the Gendarmes occurs over time until 1956, the date of the departure of the French Troops from the base at Cape Saint-Jacques. 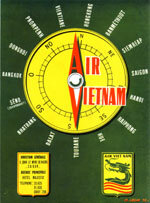 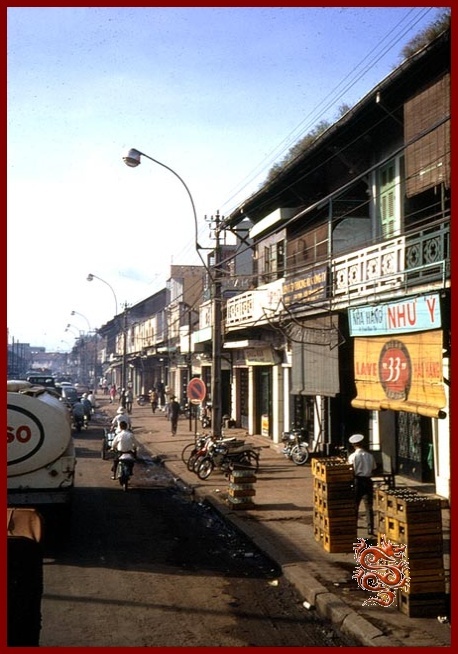 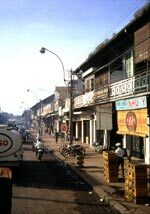 Only a few police missions remain: in South Vietnam until December 1957, in Cambodia until 1970, and in Laos until 1975. 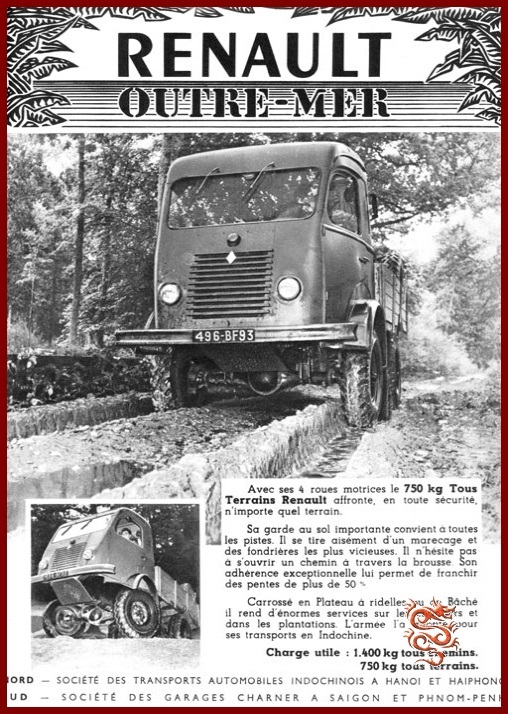 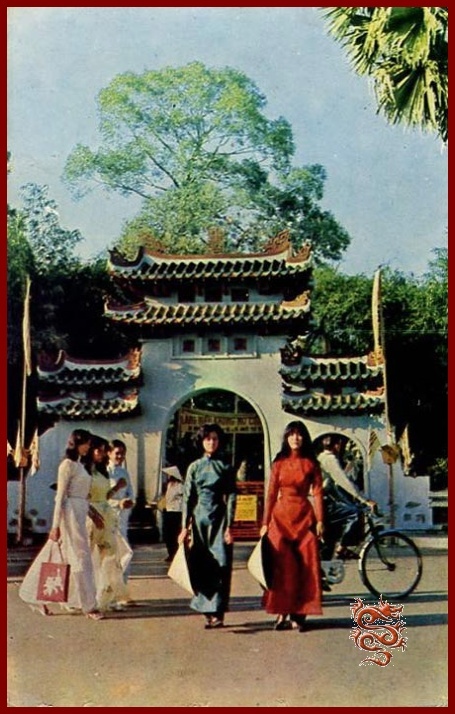 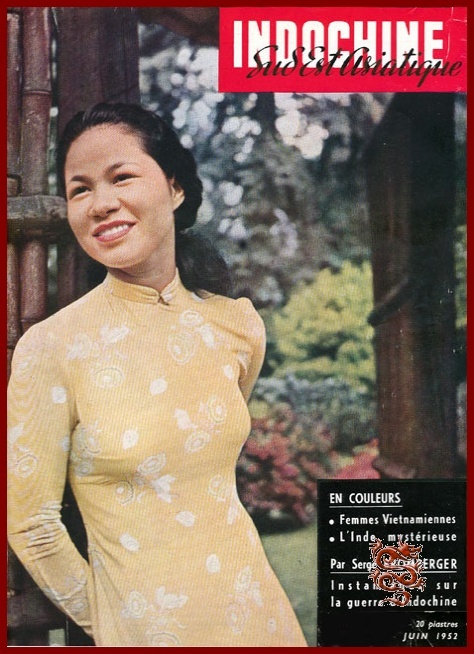 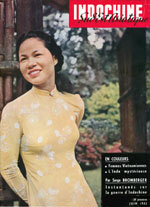 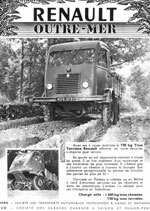 Article published in the magazine, "The Combatant of Indochina"
- African and North-African companies. 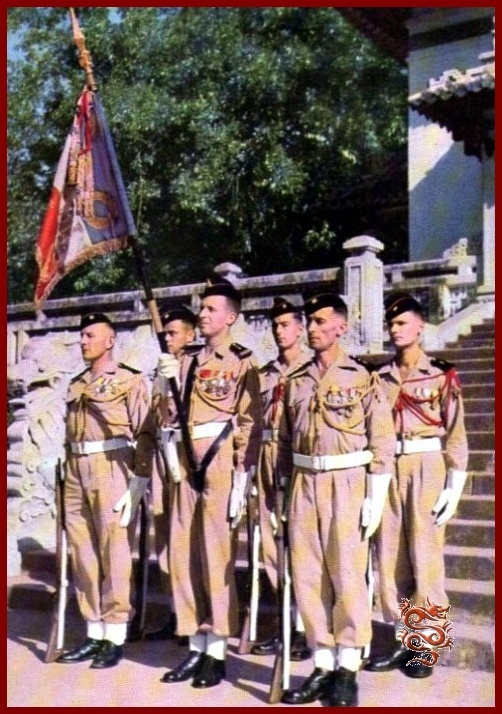 - the Republican Guard of Cochin China. - The Khmer National Guard. 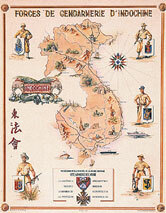 - The Guard of the southern provinces of Central Vietnam. 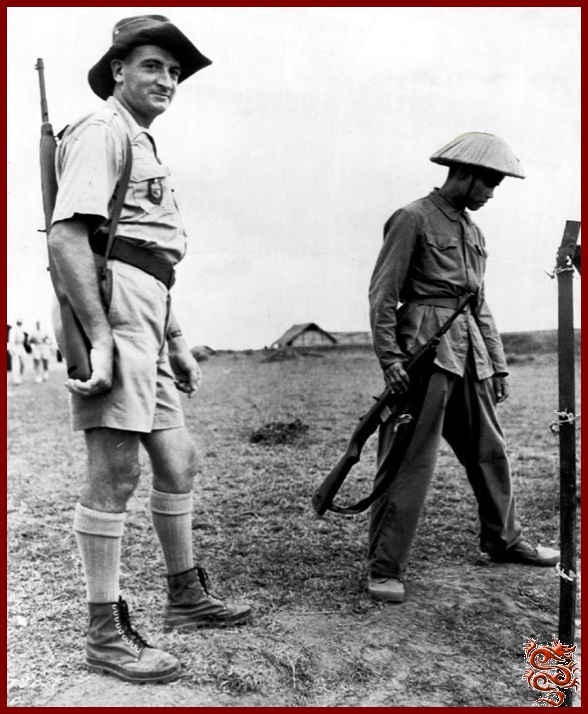 - The Eastern Tonkin Border Guard. 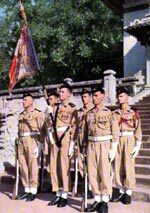 - The Central Annam Militia. - Partisan units from the plantations. - The schools for children of military personnel in Dalat and Cape Saint-Jacques. 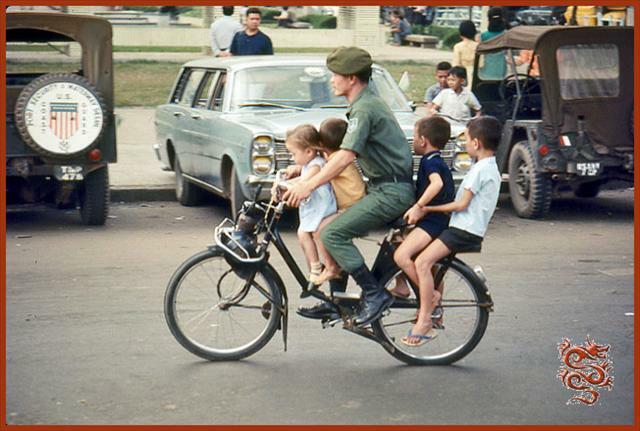 - South Vietnamese Forces training centers. 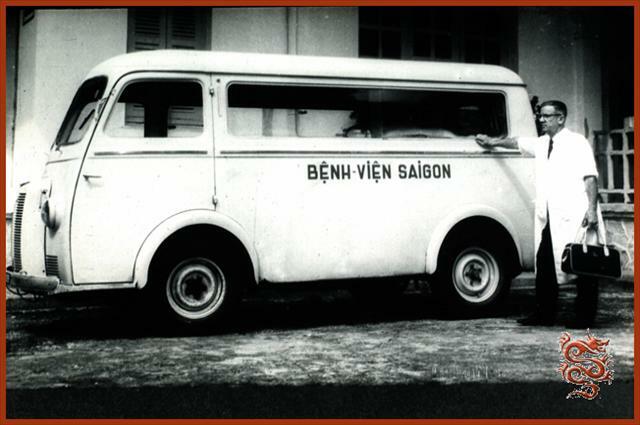 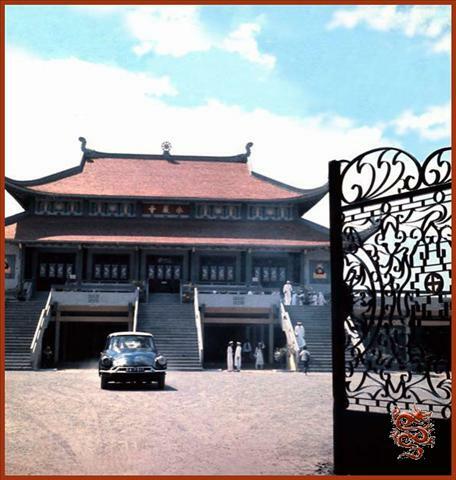 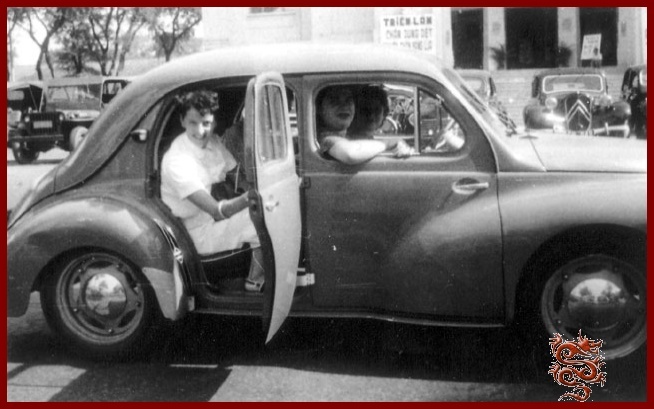 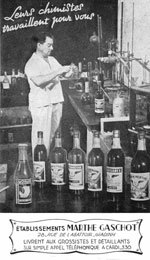 - the administration and auto service of South Vietnam. 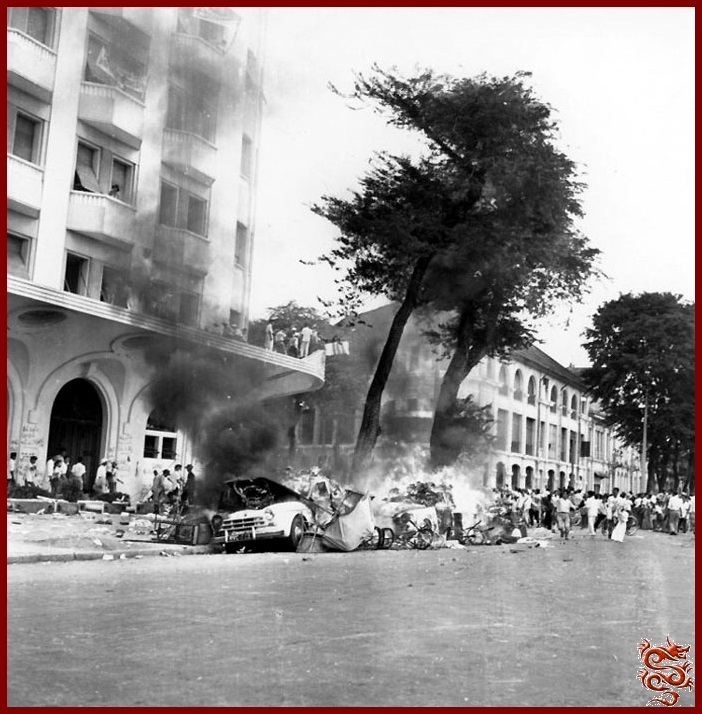 - the different missions of Vietnamese, Laotian and Cambodian police organizations. 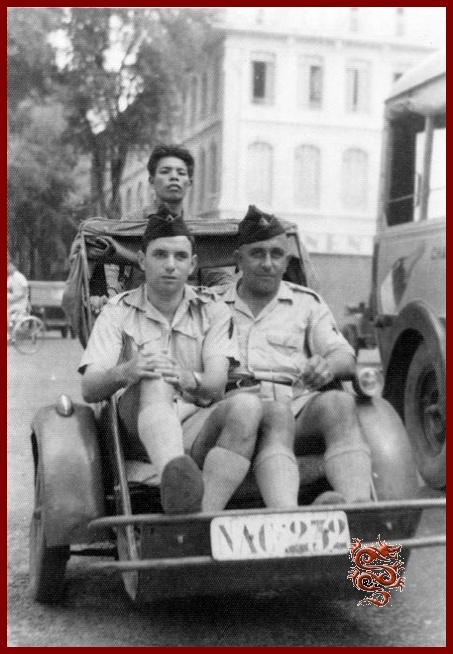 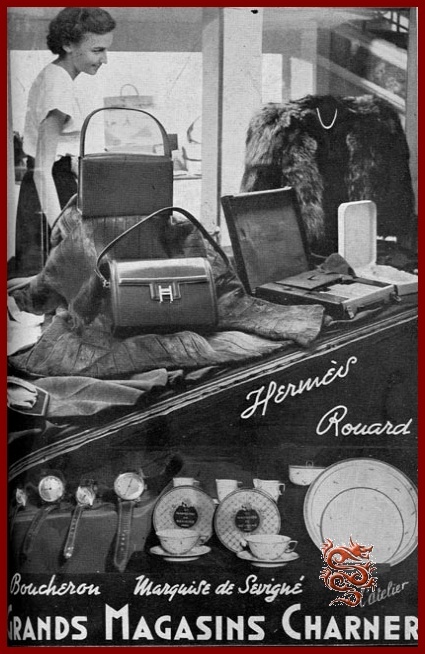 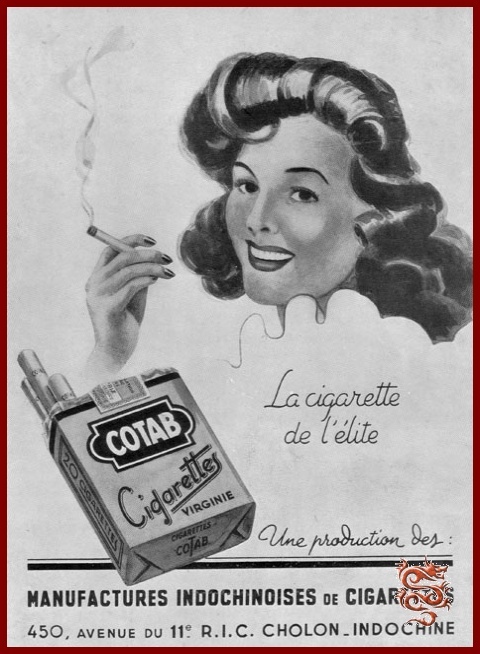 - Section of the gendarmerie. 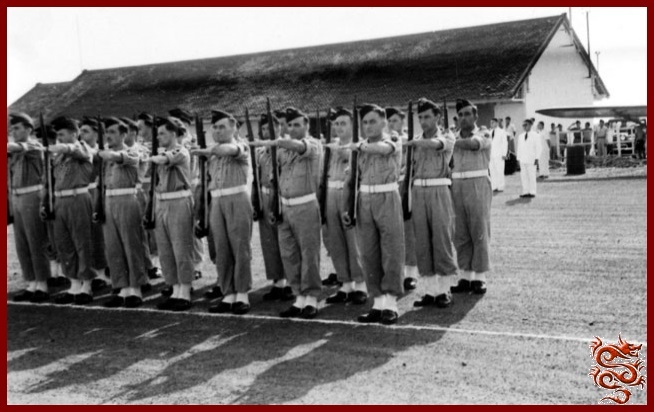 - Auto-Machine Gun Squadron (A.M.) or tank. 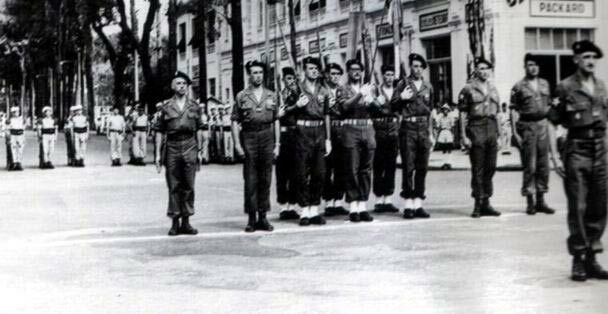 And of course, the Honor Guard and Band of The French Forces in the Far-East. 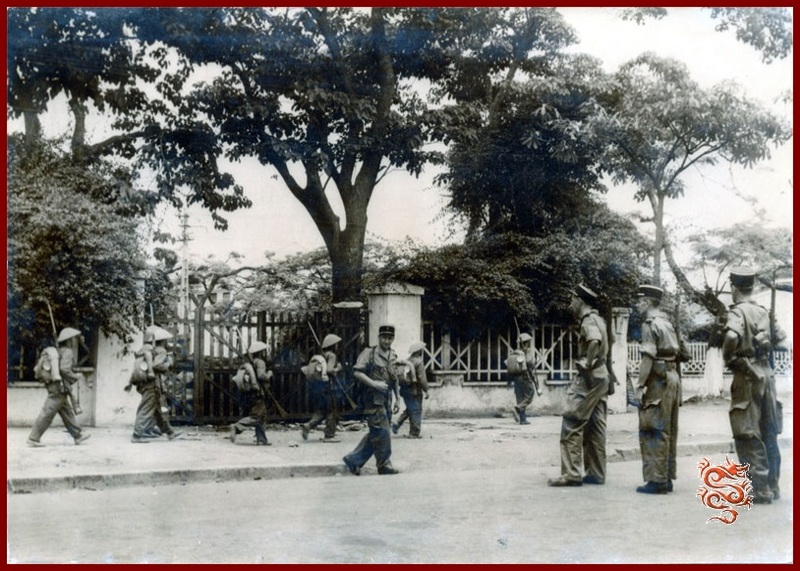 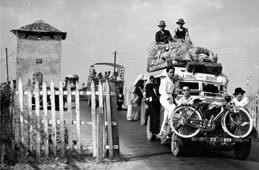 Photo taken May 18, 1955 of the arrival of Viet-Minh troops in Haiphong; in the foreground, French Gendarmes. 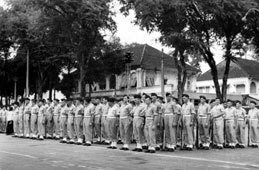 "For 300 days, the forces of the expeditionary force (...) held the word of our country as it should be, with discipline, selflessly, with pride, with total loyalty, in a spirit of honor intact . 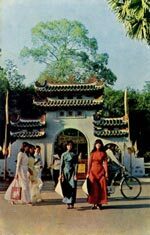 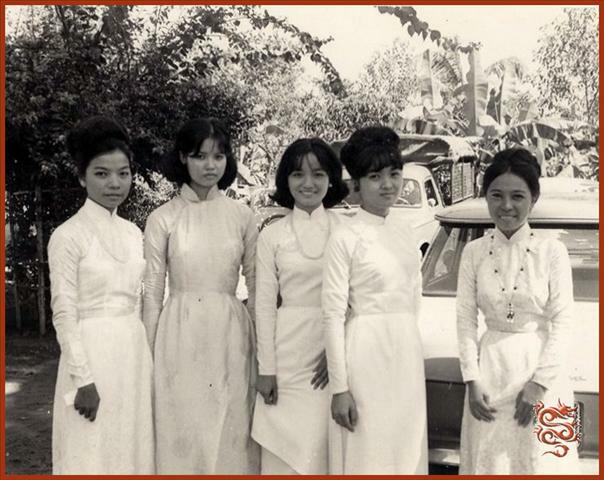 By keeping them in Haiphong, they have helped hundreds of thousands of people to choose their destiny. 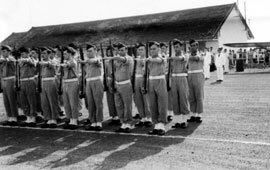 They now go head high, their task completed". 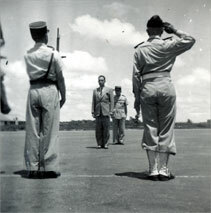 General Ély left Saigon June 2, 1955. 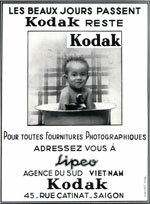 Right photo was taken by Jacques Chancel. 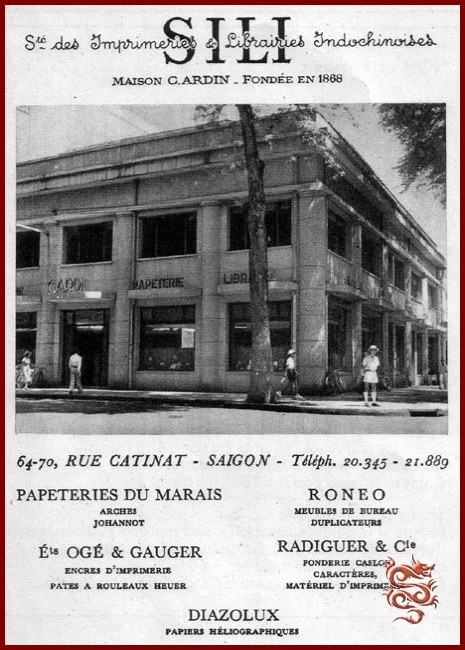 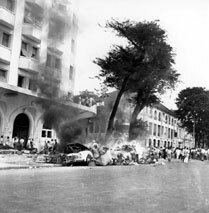 The International Control Commission blamed the representative of France for the incidents on July 20 in Saigon, during the demonstration organized in favor of Diem and against the Geneva Accords, during which the two hotels where the staff of the International Commission were staying, the Majestic and Galliéni, were looted. 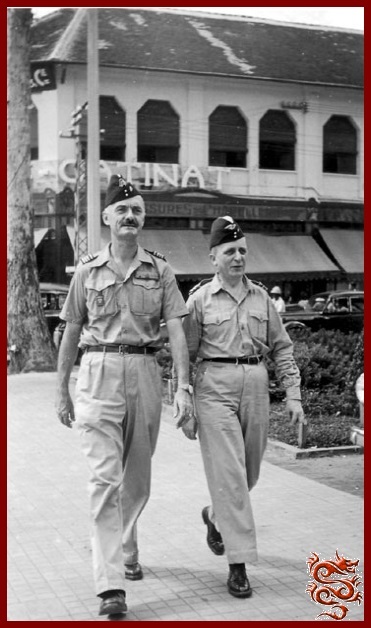 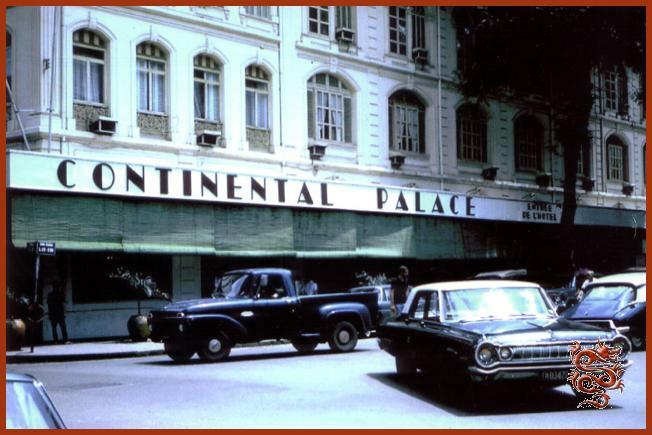 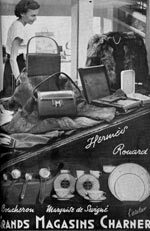 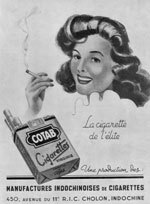 Following the looting the members of the International Control Commission (Poles, Indians, and Canadians) would stay at the Hotel Continental and would be under the protection of French police (Gendarmes). 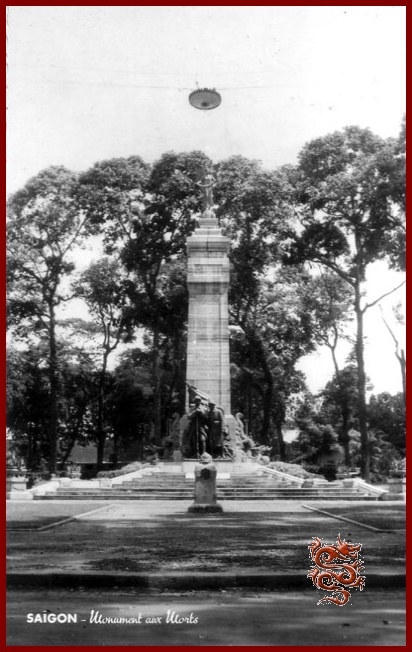 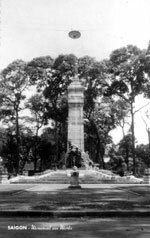 During the last parade of the French expeditionary force which took place April 10, 1956 in the streets of Saigon, two French gendarmes lay a wreath at the war memorial, under the gaze of the army corps general Jacquot, commander in Chief, Indochina. 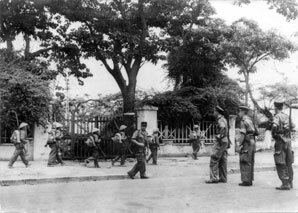 In the background the last of the French troops and officials.